After settling into the routine of a new school year, it’s important to make sure bookbags and backpacks are not causing any unwanted pain. 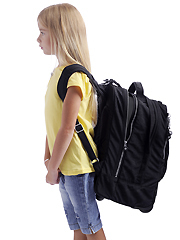 The position of bags and backpacks can put joints in compromising and injury-prone positions. These tips can help keep this from happening this school year. If you or your child bring your backpack to every class or don’t have a locker, then you are picking up your backpack as often as every 45 minutes! 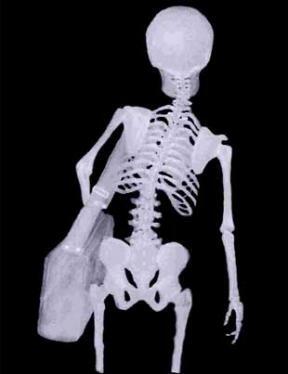 If the bag is lifted incorrectly, this can cause back pain over time. To pick up up your bag, position yourself so the bag is directly in front of you, instead of out to the side. Bent your knees to reach for the strap, instead of straining the lower back forward. Many of us (myself included) have the bad habit of flinging the backpack on instead of picking it up and sliding arms in in two distinct motions. By swinging the backpack, you may put undue twist on the spine. Tighten or loosen your straps until the bag is about one inch below the shoulder. This position will make the shoulder carry more of the weight. When the backpack is worn too low on the back, the back bears all the weight and you are more likely to arch the back for support. This increases the lordotic curvature in the spine, also called swayback posture. When carrying the backpack, use both straps! Carrying the entire backpack over one shoulder places excessive weight through one shoulder that could be distributed through both. Straps should rest in the center of the shoulder, not too close to the neck or too far over the shoulder joint. What about bags with one strap? For school bags with heavy textbooks, laptops, etc, it is best to opt for a bag with two shoulder straps. If you carry a one-sided bag or purse, switch sides frequently. The weight of the bag on one side can lead to cumulative misalignment and postural problems. Carry your bag on your shoulder instead of at the elbow crook - the shoulder has more stabilizing bones and musculature at the joint. For a one-sided bag, make efforts to keep the weight light by cleaning the bag out regularly or leaving all but the essentials at home. All the time spent carrying heavy bags during the school year adds up! Small changes can make a big difference in posture and pain. If you or your child experience consistent pain after the bags come off for the day, see a physical therapist!